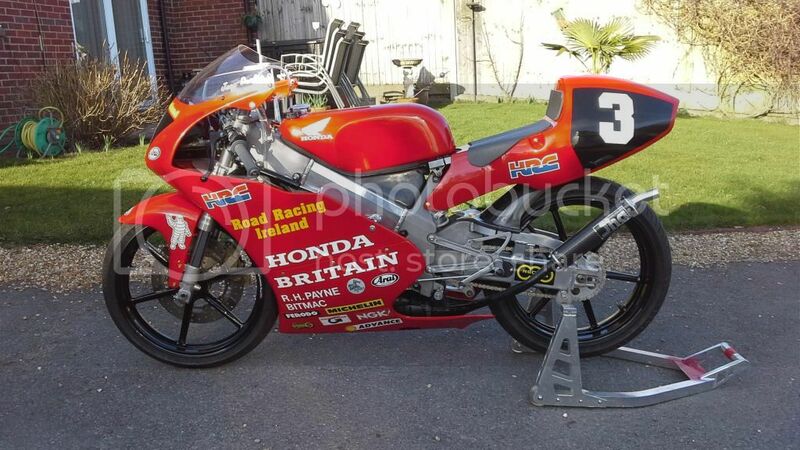 NSR250 Forums - View topic - JOEY DUNLOP replica RS125 FOR SALE. JOEY DUNLOP replica RS125 FOR SALE. For sale, my Joey Dunlop replica RS125 nx4 1997, fitted with a later 2000 engine and A kit airbox, ready to show, parade, trackday on, or race. Also have a 96 engine, completely rebuilt, can go with bike at extra cost. Bike is £5,500, engine is £1,000, deal to be done if bought together. Sorry no photos, bit beyond my capability, but look under RS125 discussion, " replaced my old one ". Thanks Les. Cheers for the photo guys. Lesviffeer750 wrote: For sale, my Joey Dunlop replica RS125 nx4 1997, fitted with a later 2000 engine and A kit airbox, ready to show, parade, trackday on, or race. Also have a 96 engine, completely rebuilt, can go with bike at extra cost. Bike is £5,500, engine is £1,000, deal to be done if bought together. Sorry no photos, bit beyond my capability, but look under RS125 discussion, " replaced organifi green juice with my old one ". Thanks Les. I may be interested if it's still for sale. Still for sale, being shown at the Mallory bike bonanza next month, so ready to go after then, sadly i will only sell to someone who can come and inspect the bike before purchase to save a lot of hassle afterwards, will only sell abroad if buyer is prepared to come and look, with the readies, sorry for the hassle, but i'm too old to be bothered with all the palava that goes with an overseas deal. have you still got this les? Re: JOEY DUNLOP replica RS125 FOR SALE. Lesviffer750 wrote: For sale, my Joey Dunlop replica RS125 nx4 1997, fitted with a later 2000 engine and A kit airbox, ready to show, parade, trackday on, or race. Also have a 96 engine, completely rebuilt, can https://www.stlcurioshoppe.com/v-tight-gel-review/ go with bike at extra cost. Bike is £5,500, engine is £1,000, deal to be done if bought together. Sorry no photos, bit beyond my capability, but look under RS125 discussion, " replaced my old one ". Thanks Les.